Plaid, sequins AND metallic? Yes please! 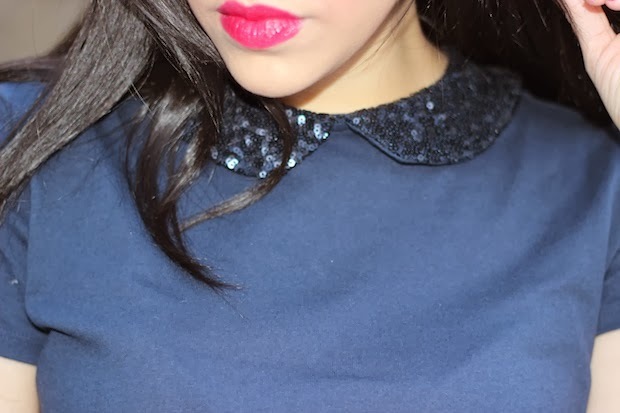 For today’s post, I created a holiday inspired look that combines three of my favorite things at the moment. I did not want to go with a black shoe, so I decided on these metallic babies that really make any outfit pop. Metallic is such a huge trend this season and especially perfect during the holidays. I’ve already gotten so much use out of them and only got them last month. Definitely a great purchase. The finishing touch as always is a red lip. As you can see in so many of my recent posts, I just can’t get enough of it. You can wear the simplest outfit but make it stand out just by adding a red lip. That little pop of color changes everything! I think an outfit like this is really cute for going to dinner or a holiday party if you aren’t trying to wear the typical dress. I have one more post coming from my collab with Tommy and can’t wait to show you my final look. Once again, thanks so much to everyone who has already gone to the store to check out my mannequin and picks! * This has been a sponsored post in collaboration with Tommy Hilfiger. This post was written by me and expresses my true opinions. Oh lovely pants and those shoes are to die for ,and that top's neck is also very cute, you are looking stunning babe…. Fabulous! Love those pants, the collar is such an adorable touch! If this ain't simply lovely then what is it?? wow gorgeous love this entire outfit from had to toe and those shoes are so fab!! Very pretty! I love how you styled this outfit – these pants are stylish and edgy and your shoes go so well! You’re looking fabulous. So cute! I love love love the pants!! It was so great meeting you at today's blogger holiday event! I love this look, it makes me want to try to add some plaid into my wardrobe. Also, yay for being a shortie like me (5'0) and wearing cropped pants as regular pants, haha!